Beauty Bungalow Gua Sha Rejuvenation = Pure Skin Bliss. Pure skin bliss. 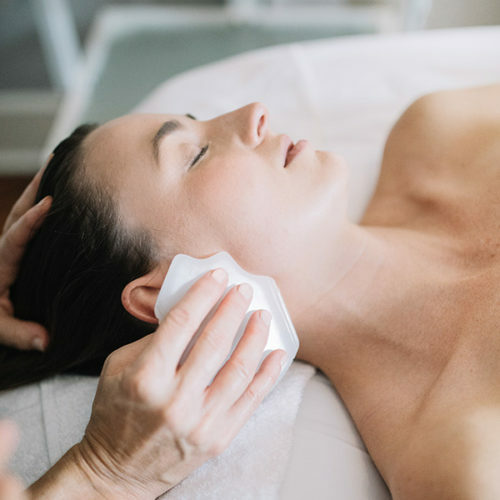 The massage focused facial unlike any other. Glow-inducing lymphatic drainage and tension-melting deep muscle release will jumpstart your skin’s own natural healing abilities. Rhythmical facial massage using a patented pure white Nefeli jade stone stimulates your lymphatic system to eliminate excess fluids and toxins from your skin. This holistic specialized face massage technique feels extremely relaxing and promotes deep healing by boosting circulation to transport nutrients to the face and scalp. There’s so much more to this healing ancient practice than first meets the eye” Vogue Magazine is calling it The Secret to Better Skin in 2018. “It tones the muscles and firms the skin, and, plus, it’s deeply relaxing. Gua Sha Rejuvenation provides deep muscle tissue detoxification. Gua Sha Rejuvenation drains and flushes out toxins via the lymphatic system. Gua Sha Rejuvenation naturally lifts and contours the muscles of the face. Gua Sha Rejuvenation offers immediately noticeable results after one treatment. Gua Sha Rejuvenation aids in the absorption of active antioxidant ingredients. Gua Sha Rejuvenation engages your parasympathetic “rest and digest” nervous system for deep relaxation.